New Leeds United manager Brian McDermott will take charge straight away and faces a baptism of fire against Sheffield Wednesday tomorrow. At his first press conference following his unveiling as Neil Warnock’s replacement, McDermott said he was looking forward to getting stuck in straight away. 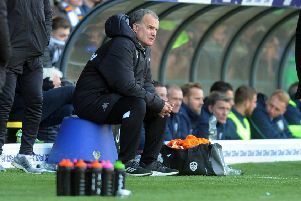 He admitted his appointment had come quicker than expected and he was looking forward to seeing what the players could do in the first game under his charge. McDermott said: “I’m absolutely delighted. I didn’t think it would happen at this stage. “We have been talking over the past 10 days, but I didn’t think it would happen until the summer. I’ve had some good conversations with Shaun Harvey and had some assurances, and I also spoke with one of the owners on Friday. “I’m confident everyone is going in the same direction and that’s the most important thing. “I met the players and they are a great bunch. There’s some really good people here. One thing that was apparent was the respect, from the players to the administration staff. “Redders (Neil Redfearn) is a good friend and I’ve been speaking to him, and I spoke to him and Richard Naylor, and Leigh Bromby on Friday morning. They are good people and are Leeds men. I just want to get stuck straight in now. “First and foremost we need the right performance against Sheffield Wednesday. We’ve five games left and that’s the immediate priority then we can look at things. “I’ll be making my own assessment on the squad over the next few weeks.